It's hard to get a sense with the many recent Early Access survival games quite what you should be doing in this game. Still, after a weekend spent in the wilds of Conan Exiles, I can tell you my defining memory. Most often, I was running. Whether that's from some NPCs much too strong for me or trying to escape some sort of mutated animal, I spent a lot of time running. In this case, I was charging away from something somehow related to an alligator, desperately charging across a dusty plain with each hit. As I ran across the field, the alligator's swipes damaged my clothes, until I was dashing across the field naked, genitalia completely on show as I reached a player settlement. That's how I met my first player character: naked, bloodied and alone, clutching an axe. 'Hi!' I said, trying to appear friendly and not naked and bloody. He was clad in armour I didn't recognise and had a sword that probably wasn't made of stone, as mine was. He could and did easily kill the alligator, before returning to size me up. It was getting dark now, the only last cast from the fire of the sacrificial altar at the side of the house. He mashed the alligator to bits while I stood near the fire, eking out flesh and hide with a pickaxe. I watched, unwilling to venture too far into the dark, hoping the player in front of me would take pity on my destroyed clothes and clear naivety. He ambled back over to me after the harvest and looked at me. Silence reigned. 'Noob,', he typed, before hitting me with his sword, felling me instantly. 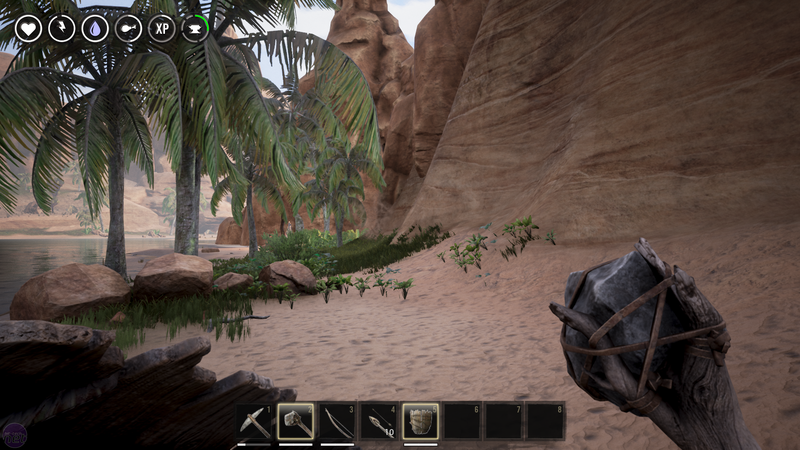 I respawned, back where I'd started, next to some dusty rocks in the middle of nowhere. 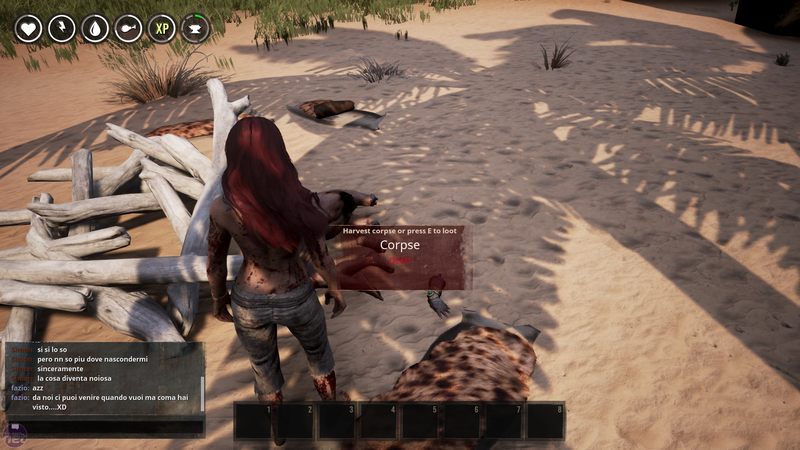 This experience was emblematic of my experience with Conan Exiles: a hard life scrabbling amongst the dirt to try to get gear, a pointless and brutal death followed by new life that's just as hard. 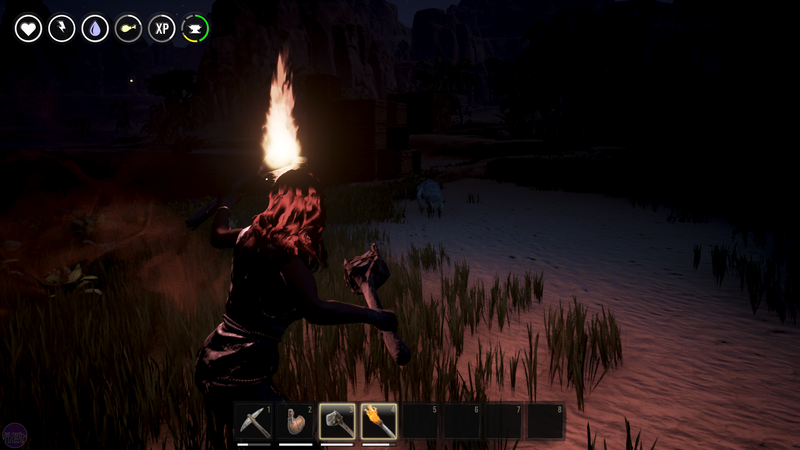 Getting some simple items together is 10 minutes of diligent work, so the downtime after each new attempt at survival provides a nice break, at least. On death, you'll lose everything except the levels you've acquired, and much like its genre-stablemate, Ark: Survival Evolved, you'll need to grind up through the levels so you can craft not just weapons, armour, and basic survival tools but also the ability to grow other structures too. Levelling up is easier here than in Ark, but it still means a lot of punching turtles to death and generally causing trouble. Most of what I got up to over the weekend could be described as causing trouble, it's just more often than not the trouble was for myself. Letting myself into the open door of a player's base while they ran outside to fetch something led to them angrily hitting me to death, and eagerly starting fights with everyone I found often led to me going to the great respawn point in the sky too.